First of all, let us start off by say­ing that this show was a cast­ing night­mare!! Not in a bad way, because the tal­ent was out­stand­ing. That is the rea­son it was a night­mare. It was not as cut and dry as a lot of audi­tion processes. We truly wish that we could include more peo­ple and have a cast of 40, but eco­nom­i­cally that is not feasible. We want to pub­licly express regret to those who did not make the final cut. It is not because of lack of tal­ent on anyone’s part. Choices are made on the terms of the total look of the com­pany and being true to the period. For instance, you might be sur­prised at our choice for the role of Andy, who in the orig­i­nal show is a male char­ac­ter. How­ever, since Andy is the chore­o­g­ra­pher for “Pretty Lady,” the 42ND STREET show within a show, the actor must be extremely flu­ent in tap danc­ing. Hence our choice of Jen­nifer Hast­ings to play the part. We truly admire each and every one of you who audi­tioned. The improve­ment from night to night was over­whelm­ing, and it was a plea­sure to behold. We sin­cerely hope that EVERYBODY will con­tinue to help SCT thrive in future pro­duc­tions, and look for­ward to work­ing with ALL of you in the future. Please call the the­atre at 473‑2400 to con­firm acceptance! We still need two or three addi­tional tap­ping men. If you know any­one who is inter­ested please have then call 209 473‑2400. 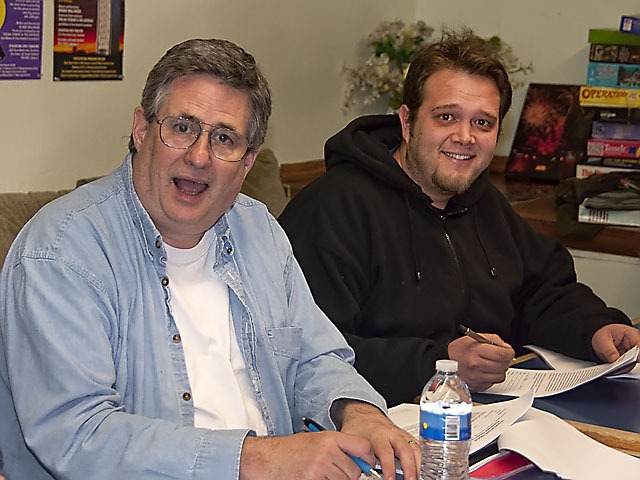 FIRST READ THROUGH: Sat­ur­day, April 2, 2011 from 1:00–4:00 p.m. at the the­atre! Sched­ul­ing con­flicts must be cleared with Jim Cole­man in advance. 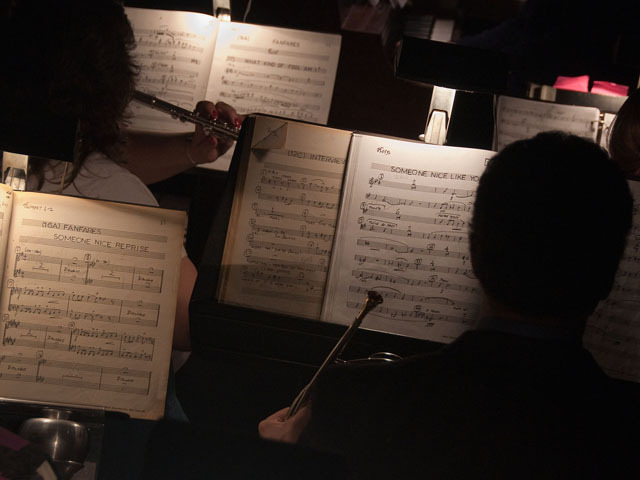 This entry was posted in General Information on March 30, 2011 by stocktoncivictheatre. Hey, Jim Cole­man, where did you get that cool t-shirt? 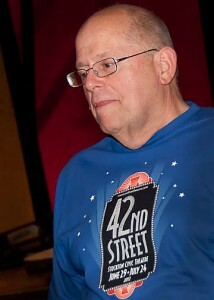 It’s Sun­day evening March 27, and audi­tions for Stock­ton Civic Theater’s big Sum­mer pro­duc­tion, 42ND STREET began at 6:30 p.m. under the lead­er­ship of Jim Cole­man, Direc­tor, and Eve­lyn Bar­ney, Chore­o­g­ra­pher. Atten­dance was high, with actors, singers and dancers both new and expeienced com­ing to demon­strate their per­form­ing skills and enthu­si­asm for the show. All those in atten­dance had an oppor­tu­nity to sing a song of their choice onstage with Jim at the piano, and tap dance in the rehearsal hall with Eve­lyn. Another evening of audi­tions will be held on Mon­day evening March 28, and all inter­ested actors and dancers are encour­aged to attend. Please join us! There is a par­tic­u­lar need for male tap dancers. Call backs will be held Tues­day evening March 29. 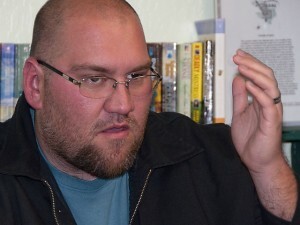 This entry was posted in General Information on March 27, 2011 by stocktoncivictheatre. From Artis­tic Direc­tor Jim Cole­man — Audi­tions for 42ND STREET are com­ing up this week­end, and I just want to make sure that every­one remem­bers! It’s been a while since the notices went out, and I want to extend another invi­ta­tion to encour­age every­body to come. This is a won­der­ful show, and one that I spent a fan­tas­tic year doing at the Shu­bert The­atre in Los Ange­les in 1984. We need male and female tap dancers who sing, and there are won­der­ful char­ac­ter parts that will come out of the ensem­ble. Take another look at the audi­tion notice posted on our web­site. Hope to see you there either Sun­day, March 27, or Mon­day, March 28. Call­backs are on Tues­day, March 29. All audi­tions are held at the the­atre at 6:30pm. Be there! Editor’s Note: Direc­tor Jim Cole­man was nom­i­nated for a Critic’s Pick Award for his work on the L.A. production. This entry was posted in General Information on March 23, 2011 by stocktoncivictheatre. 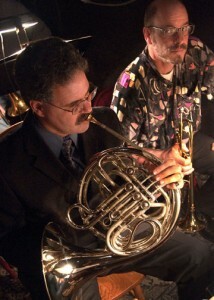 Paul Kim­ball and his french horn play “The Boss” in Stop the World, while trum­pet player Hal Wal­len­borg looks on. The orches­tra con­sti­tutes the heart of any musi­cal pro­duc­tion, but in Stop the World — I Want to Get Off, a brass instru­ment actu­ally plays a human role, as Paul Kim­ball and his french horn speak for “The Boss,” who is the main char­ac­ter Littlechap’s work­place office supe­rior, men­tor, and father-in-law. 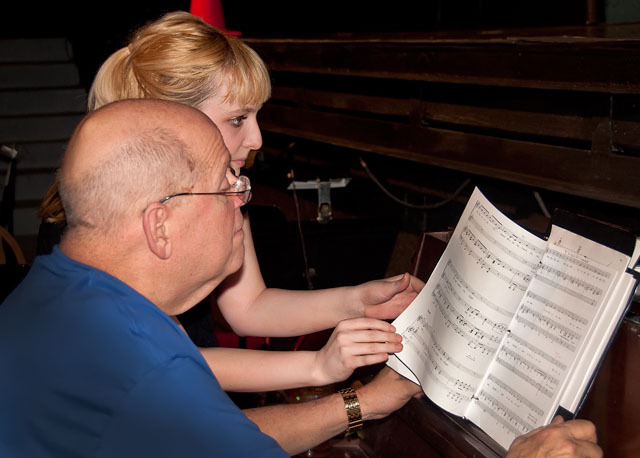 A music edu­ca­tor in local schools, Paul Kim­ball has in the past served as Musi­cal Direc­tor and Con­duc­tor for SCT shows and also works with his wife in man­ag­ing the theater’s sum­mer youth pro­gram, SCT, Jr.
For its pro­duc­tions, SCT employs pro­fes­sional musi­cians, who unlike the actors and most of the theater’s other vol­un­teers, are paid for their time, thus pro­vid­ing an oppor­tu­nity for finan­cial “Angels” to play a vital role by spon­sor­ing the music. Stop the World marks per­cus­sion­ist John Wells’ thirty-fifth show at SCT, in addi­tion to his 19 shows in the pit at San Joaquin Delta Col­lege. Out­side the­atre, John leads the ABBA Trib­ute Band Water­loo, and plays drums with sev­eral other local groups. For more back­ground on John’s spec­tac­u­lar music career, check his web­site at johnswells.com. Bar­bara Maters, flutist, has lived in Stock­ton over 35 years. Cur­rently a music teacher in Stock­ton Uni­fied School Dis­trict and a flute/piccolo player with Stock­ton Sym­phony, she loves musi­cal theater! Kyle Wong is a string bassist who has been with SCT for sev­eral years. He received his degree in music per­for­mance at Uni­ver­sity of the Pacific, and finds it a great plea­sure to play and work with all the ter­rific musi­cians who help bring SCT shows to life. When he isn’t in the SCT pit, Kyle is a Phar­macy Tech­ni­cian at CVS Phar­macy. Other musi­cians play­ing with the Stop the World orches­tra are Cathy Ettle on wood­winds, Hal Wal­len­borg on trum­pet, and Christo­pher Ander­son on Trombone. Jim Cole­man con­ducts and plays piano for the show. This entry was posted in General Information on March 20, 2011 by stocktoncivictheatre. Direc­tor J. Lee Vocque dis­cusses The Odd Cou­ple with actors at first “read through” rehearsal. On Sun­day evening March 20, Direc­tor Jaye Vocque met with his cast for a first “read through” of The Odd Cou­ple. Return­ing to the SCT stage after a 12-year absence, Vocque has a long his­tory of direct­ing in California’s Great Cen­tral Val­ley, and more recently in Florida. His wife Karene also has a rich back­ground in the­atre, and will serve as Stage Man­ager for this com­edy pro­duc­tion. The cou­ple lives in Lodi.